Facing aggressive cancer and family tragedy, Lucy Kunz '78 took her fight underwater. Lucy Embick Kunz ’78 climbs onto the arm of the sofa, squats in her white sock feet and throws her whole body into the tale of her recent near-gold experience at the German Life Saving Championships. The small-framed swimmer grabs below the arm of the sofa and demonstrates how she was perched on the block—one that was more slanted than usual—and ready to dive in. Just then, Lucy recounts, she tipped forwards off the block, starting before the gun fired, disqualifying her from the second discipline, the combined swimming event. Lucy had already finished 12 meters ahead in the 50-meter freestyle, the first event of the three-part competition. She knew gold in her age category was within easy reach. “I would have won,” she says, squinting her blue eyes, clearly still furious with herself. Lucy has endured 157 days of chemotherapy, three months of radiation and 13 operations on what was once a near-perfect body. She has demonstrated pure mind over matter—winning dozens of golds and breaking an International Life Saving Organization world record in obstacle swimming with a body pumped full of toxic chemicals designed to fight off tumors. 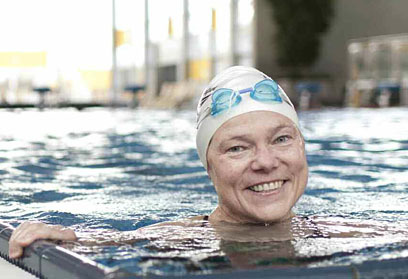 She says her greatest achievement may have been when she won the German Masters gold for the 200-meter backstroke in April 2010, about a week after her 118th day of chemotherapy. She has done all this while grieving an unfathomable family tragedy. Her older brother, Dr. Andy Embick ’72, the one she followed to Pomona, the brilliant and restless Rhodes Scholar she had always looked up to, committed suicide just months before she was diagnosed with cancer eight years ago. LUCY’S LOVE AFFAIR with swimming started in kindergarten at her local YMCA in Salem, Ore., where she grew up as the third of four children. Her mother is a lawyer, and Lucy’s late father worked as an orthopedist. Lucy says the Embick children weren’t pushed to achieve. But excellence was in the air at home. She and Andy were always close, and he swam too, even though swimming was not something they shared in a big way. Andy learned to love gymnastics as a teenager and later preferred the thrill of pursuits such as rock climbing and whitewater paddling. Lucy remembers the time, when she was a kid, that Andy embarrassed her at the pool by walking around the deck on his hands, as if in a gym. That was Andy. Lucy followed Andy to Pomona after he told her she’d like it better than the other schools she’d applied to. Somehow, Andy was always right. At Pomona, Lucy still went to the pool to keep fit, but she gave up swimming competitively to concentrate on her studies. Burdette Poland, a Pomona professor of history emeritus who taught Lucy in three courses, recalls Lucy as competitive, honest and determined. He remembers how she “broke loose” in her comprehensive exams in history, doing better work than she had ever done before and ranking third among history majors that year. Lucy and Preston dated steadily for two years when Lucy was a sophomore and junior. The pair would lose themselves in conversation about archeology and art history. Looking back, Preston recalls Lucy being in her prime during her Pomona years, except for having to live in the shadow of the monumental reputation of her brother, who had routinely scaled the side of Smiley Hall to get to his room instead of taking the stairs. Andy and Lucy both were accepted at Harvard in their post-Pomona years, and Andy did go on to Harvard Medical Schoolafter his time at Oxford on the Rhodes Scholarship. But Lucy, after earning a master’s degree in art history at the University of Oregon and going on a Rotary Foundation scholarship to Munich, chose to attend the University of Pittsburgh for her doctorate because of the financial aid package. The siblings maintained a close relationship despite the thousands of miles between them. Andy, a physician, made his home in Valdez, Alaska, and Lucy settled in southern Germany, raising three sons with her husband Roland, who works in banking. Lucy met Andy regularly for ski trips in the Alps, followed his expeditions with interest and consulted him for medical advice regarding her children. All along, Lucy would find time for brief swims, but only when her children joined a team did Lucy return to competitive swimming. Within no time, Lucy began racking up the medals at swim competitions across Germany, pleased that she had found a way to combine her love for swimming with her responsibilities to her family. In 2002, Lucy won three gold medals at the Life Saving World Championships in Florida and was named athlete of the year in Schweinfurt, where she practices swimming and teaches everyone from toddlers to triathletes. Then came the news that Andy had rowed his skiff out onto Prince William Sound and killed himself. Why Andy made this choice remains a mystery to Lucy. She confesses, “It’s a tragedy which, in its profoundness, is incomparable to anything else in terms of being an incalculable shock to me and to our whole family.” Lucy believes the shock compromised her immune system. AFTER THE CANCER DIAGNOSIS, Lucy at first focused on the pain, the suffering and the fear she felt in the face of cancer and the treatments. But she intuitively understood that she had to turn negative feelings into positive emotions in order to survive, so Lucy began swimming in even more competitions, just when most people would have believed that impossible. The initial diagnosis of cancer and the ensuing treatments only kept Lucy away from swim meets briefly. To her doctors’ amazement, she won four gold medals at the Bavarian long-distance championship in March 2004, less than four months after her first operation. Lucy began to develop a personal philosophy about living with the disease. She had seen how other cancer patients had given up quality of life during treatment, and she resolved to follow a different path. And, as the years went by, Lucy says Andy’s death increased her determination to survive. “He gave me even more reason never to give up,” she says. Lucy’s medical advisers say her attitude has been a key part of her survival. “Frau Kunz keeps fighting … Such illnesses do not have to be accompanied with weakness and low performance, if patients are willing to actively do something about it and fight their way through,” says biochemist Ulrike Kämmerer, who Lucy consults on her diet. Kämmerer and a colleague at the University of Würzburg, medical physicist Rainer Klement, were co-authors on a recent paper about the benefits of a high-fat, low-carb diet for those diagnosed with cancer, the diet Lucy keeps and one she calls the “Atkins diet” for cancer patients. In the paper, titled “Is There a Role for Carbohydrate Restriction in the Treatment and Prevention of Cancer?” published in October in the journal Nutrition and Metabolism, the two explore the effect of glucose on tumor cell proliferation. Lucy herself says having strong and supple muscles has helped her recover quickly from numerous surgeries to remove tumor growth from different parts of her body. Her rigorous swim training has reduced her pain substantially and become her best physical therapy. “After all that radiation, if I hadn’t really pushed myself, I wouldn’t be able to move today much at all,” Lucy says. IT’S TUESDAY, THE DAY when Lucy devotes herself to her students at the pool. She is conducting a class with nine small children. As she helps the little ones with their backstroke, Lucy’s strongest stroke, she holds their small heads in her palm like a healer. On this particular afternoon, Lucy skips the nap she usually takes poolside. Typically, she lies down on the tiled stadium bench for a doze. Lucy has organized her chemotherapy treatments and her schedule around her coaching commitments and her own swimming routine. She even manages her available energy throughout the week so that she can be at her best on Tuesdays. Dealing with her lack of energy is just one side effect that Lucy has had to learn to live with. She says it took her years to come to terms with the limitations that the disease brings with it. Lucy has hit multiple physical low points but, she says, the thought of giving up doesn’t enter her mind. In 2010, while on holiday in Michigan, she says she experienced pain at a level of 13 on a scale of one to 10 after two months of thoracic radiation. “I basically lay on the floor of the summer house all vacation,” Lucy recalls. Professor Poland compares her fight with cancer to the story of Persephone from Greek mythology, since Lucy is forced to live another life in a different realm when she’s undergoing cancer treatments. “Lucy has the good fortune to be able to come back but always with the limitation that she has to return to the underworld before the end of the year,” says Poland, who has been corresponding with Lucy in recent years. Lucy’s story of courage also helped Richard Preston as he recovered from a shattered pelvis after a ski accident in 2010. A few years earlier, the author had taken up tree-climbing while researching his 2007 book, The Wild Trees, about the people who climb some of the world’s tallest. After the ski mishap, he feared he “would never climb a tree again,” Preston says. “I thought a lot about Lucy during that time. If Lucy Embick Kunz can break the world record in swimming with ovarian cancer, then climbing trees with a shattered pelvis ought to be doable.” Preston has now increased the vertical distance he can climb to that of a redwood tree. He did it in honor of Lucy. EIGHT YEARS INTO THE FIGHT, Lucy hardly seems battle-weary.Just recently, she received news that her tumors had not shown medically relevant growth, which meant she could extend the pause in her chemotherapy for another three to four months. “I feel like I have been saved from a burning airplane,” she says. Amid her cancer treatments and swimming meets, Lucy still grieves the loss of Andy: “There is never a day when I do not miss him.” Resolving the tragedy isn’t possible, but she is no longer trying to find answers about why Andy did what he did. “Andy was always absolute in his decisions. I have accepted it,” Lucy says. Nor does she complain. Andreas Moser, who coaches triathletes with Lucy at the Silvana pool in Schweinfurt, notes that Lucy doesn’t talk much of her cancer. She will just occasionally mention in a neutral way that she’s going to lose her hair again, something that makes her bathing cap the perfect accessory.